Tracy H. Bowers is the Managing Director for Matrix Residential, the property management division for Pollack Shores Real Estate Group. In this role, Tracy is responsible for the overall operations of the management company as well as focusing on strategy and client relations. 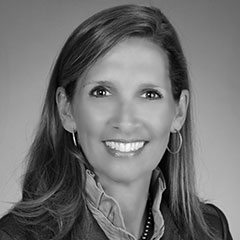 Tracy joined Pollack Shores Real Estate Group in 2011 with over 20 years’ experience which included the oversight of The Worthing Companies management division and the Greystar Atlanta City office. During her career, Tracy has managed over 50,000 units in the Southeast and Southwest submarkets. She is especially proud of the successful lease-up of over 70 new developments and the orchestration and implementation of 45 value-add/renovations. She has extensive experience in the Atlanta, Dallas, Houston, South Florida, Tampa, Jacksonville, Orlando, Ft. Myers, Austin, Richmond, Nashville, Raleigh/Durham and Charlotte markets. Tracy also works closely with the development teams and is highly involved with the architectural and design processes. Tracy earned her Bachelor of Business Administration from The University of Georgia and a Master of Science in Management/Organizational Behavior from Georgia State University. Tracy also earned an Interior Design degree from The Art Institute of Atlanta. She is a Certified Property Manager through the Institute of Real Estate Management and a member of the National Apartment Association, Georgia Apartment Association and Atlanta Apartment Association. She serves on the board of the Atlanta Apartment Association and is currently President-elect. Tracy currently resides in Roswell with her husband, Johnny, and two children, Natalie and Annie.